David kills Goliath and walks over him as a victory show. Sup people. It's been like forever since I posted something last. So, I was really glad when the rather unusual concept for this photograph came to me; somewhere in there, I was already feeling like I'd lost the last bit of creativity in me. 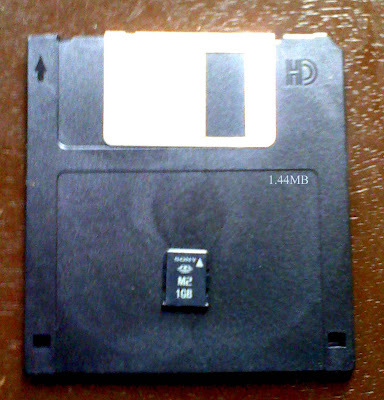 The Sunday before the last, I was at home preparing to return to school when my mum called out from her room, "I suppose there's no use for these floppy disks anymore". My impulse was to agree with her but on second thought, I changed my mind and decided to keep them; even though they would no longer be useful for storage (which is their only apparent use), they were at least worth keeping as relics for a technology-oriented person like me. Thus, I collected the pack of 4 or 5 diskettes from her and took it to my room. Getting to my room, one of the first things I saw was my 1GB M2 memory card and I bet you don't need any telling what came next. I started a photoshoot instantly and came up with the picture which this blogpost is based upon. P.S. What name do you think befits the picture best? Please drop your comments, thanks. *this is like my shortest post ever!! !